– Cut banana into bite size pieces. 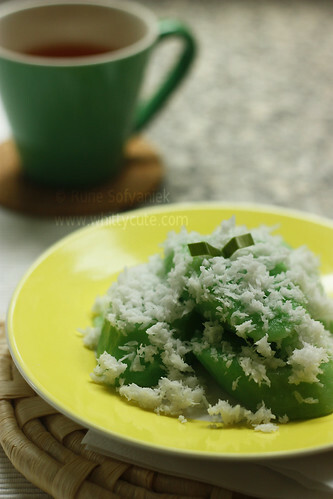 Mix rice flour, salt, pandan essence and water into thick consistency. 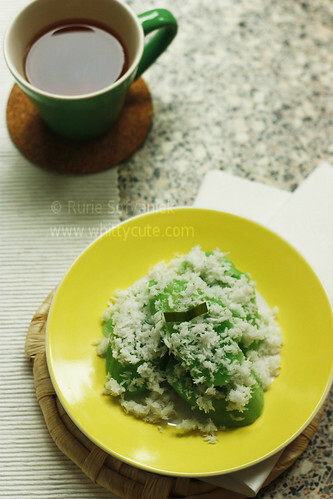 – Coat banana generously with the batter, meanwhile boil a pan of water with the pandan leaf. – When the water has boiled, dip the banana batter and boil with low fire for approximately 10 minutes. 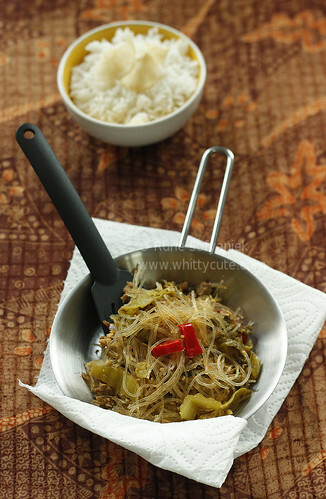 – Drain with slotted spoon and served with steamed grated coconut. Time for masbar again 🙂 and this month’s theme is really healthy and also real nice. 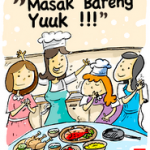 Why healthy because it’s vegetable and nice because it’s Indonesian. Oh how I love Indonesian food (lebay-mode-on). Talking about this dish, it’s really popular in Bali. It’s originated from the eastern part of Bali which is Klungkung but you could easily find it in other part of Bali. I used to buy it for just Rp. 1000,00 a package (though not sure about the price now?) at the pasar senggol (night market) and it was more than enough for two persons to accompany rice. I warn you though, if you’re not so fond of -oh-darn-it’s-so-hot-makes-my-mouth-on-fire-kinda-food- then better ask less of the sambal koples (peanut sauce). But for me the hotter the better. Oh how I miss Bali….sob sob…..
– To make the peanut sauce, use a pestle and mortar (me: food processor) to pound the peanuts, chilies and shrimp paste into a fine paste. Add the lime juice, water, coconut oil and a little bit of salt and mix well. – To make the coconut sauce, use a pestle and mortar to pound the garlic, galangal, lesser galangal, chillies, shrimp paste, sugar and a little salt to a paste. 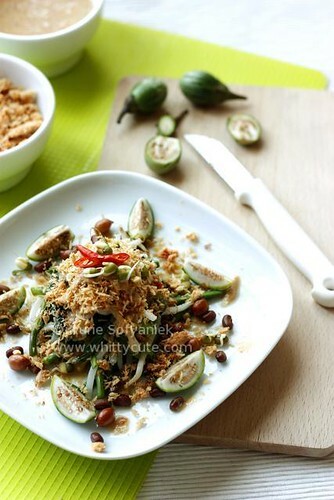 Mix in the grated coconut. – Just before serving, mix the vegetables and sauces together. A really humble dish from my mother’s hometown in Blitar. 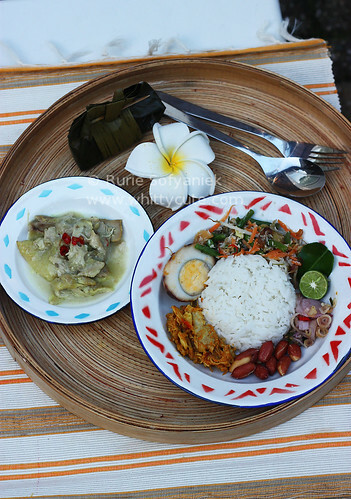 It is usually sold in pair with Pecel Punten. A dish that I would always buy or beg my aunt to make when I go there. A sort of comfort food if you may say. But weirdly since I live here I could cook dishes I never imagine I could cook by myself not even in a million years 😀 now that is a good side of living 12.000km away from home. Life is not that bad right 😉 You just have to make the most of it. Back to my dish, I enjoyed it while sitting in my balcony, the sun was shining, the wind was caressing me gently. I closed my eyes and just imagined sitting in the kitchen of my aunt’s house back in Blitar. – I used 1 instant rice cake in plastic sachet but of course you are free to use your own method of making rice cake. 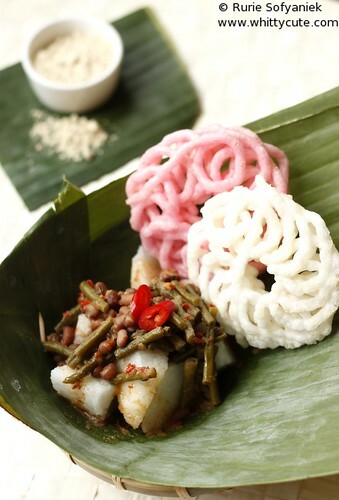 – Boil rice cake in lots of water along with the lime stone water for 2 hours until rice cake is done. – Cooled rice cake in a colander. – 200 gr Kacang Merah, soaked overnight (adzuki beans, haricot rouge, red bean, Vigna angularis) In Indonesia we usually use kacang tolo (Vigna unguiculata) but I couldn’t find that but the red bean tasted just as nice. – Grind shallots, garlic, chilies, salt, dried shrimp paste, sugar, dried shrimp into a paste. – Fry spice paste until fragrant, add galangal and salam leaves. – Add water and coconut milk, wait until it boils. – Add kacang merah then after five minutes add long beans. – After the vegetable is soft add fried tofu. – Stir now and then and cook until it’s all done. – It’s even better to eat the next day of cooking. 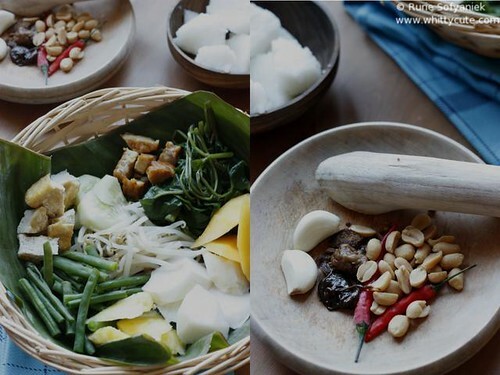 Feel free to mix and match vegetable of your choice ie; jackfruit, labu siam (chayote), bamboo shoot. 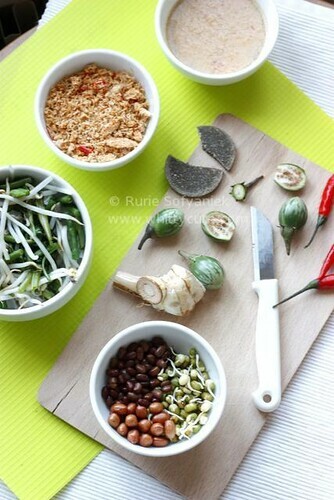 – Panbroil soy bean, kaffir lime leaves, lesser galangal until dry and soy bean is done. – Grind in a food processor until smooth, add fried garlic and salt. – Sieve with a colander to get a smoother result. 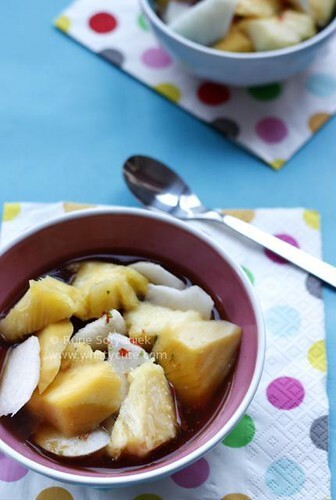 – Cut rice cake into bite size pieces, top with vegetable. 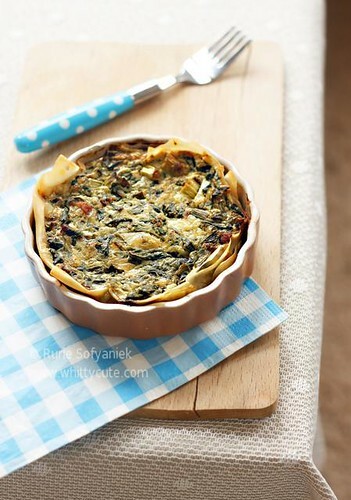 – Sprinkle with soy beans powder. Looking for a controversial dish. This could be the one 😛 And why is that? If you could guess from the title, this was made from pindang water (fish in brine). The taste and the smell of pindang water is so distictive. Usually only native Balinese (from the southern part, Denpasar and the sorrounding) would like this one, even a Balinese friend of mine who was from western part wasn’t fond of this food. But I grew up in Bali since I was 5 until I was 25 so I grew up with this too. It’s a dish that you either would hate it or love it. For me I love it to bits. – Cut vegetable into bite size pieces. – Pound chili, palm sugar, salt and dried shrimp paste until smooth. – Pour in pindang water, mix well. 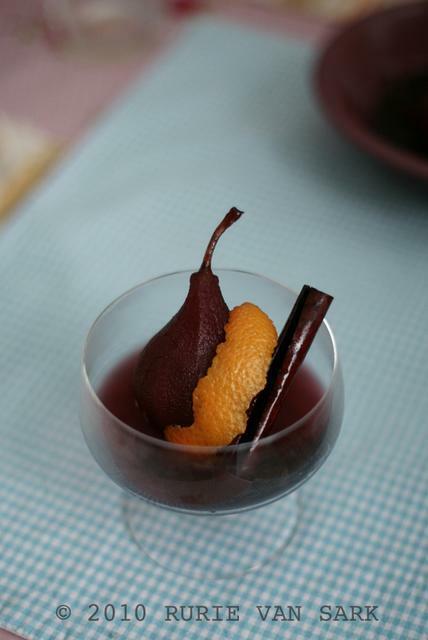 – Pour over the fruit. 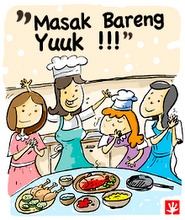 – Boil all ingredients until fish is done, cool down the pindang water before using. Actually real version of this dish is Rujak Cingur, but since I didn’t use any cingur (cow’s nose that is :P) I couldn’t use the same title. – Cut, cleaned and blanced the vegetables. 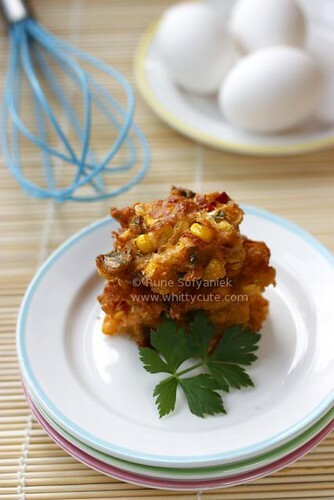 – Cut and deep fried tofu and tempe. – Cut and cleaned the fruits. – Pound the sambal petis ingredients in a pestle and mortar. Adjust the taste to your liking. 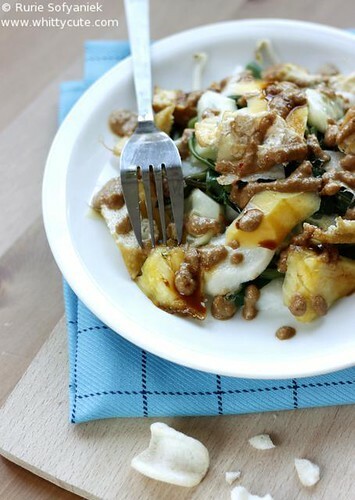 – In a plate put some rice cake, vegetables, tofu and tempe, fruits. Topped with sambal petis. – Served with shrimp crackers.